WINNIPEG — Johnny Gaudreau had a hat trick as the Calgary Flames ended a three-game losing skid with a 4-1 victory over the Winnipeg Jets on Thursday. Mark Jankowski had a shorthanded, third-period goal for Calgary, which was 0-2-1 heading into the game. Sean Monahan contributed three assists and Elias Lindholm added a pair. Gaudreau’s first goal was actually a redirection by Jets forward Patrik Laine, who stuck out his stick to block a Gaudreau pass attempt to Lindholm, but the puck went by goalie Connor Hellebuyck. His third goal was into an empty net. David Rittich made 35 saves for Calgary (23-12-3). Hellebuyck stopped 24 shots for Winnipeg (24-11-2). The Jets are still first the NHL Western Conference, one point ahead of Calgary. Winnipeg outshot Calgary 14-7 in the scoreless opening period, with both teams a bit sloppy after their Christmas breaks. Rittich made a couple of key saves as the Flames went 0 for 2 on the power play and the Jets 0 for 1 in the first 20 minutes. A few minutes later, Jets fans had a bit of a scare when Hellebuyck bent over to smother a puck with his glove at the side of the crease. The knee of Flames defenceman Noah Hanifin caught the goalie in the head, knocking off his mask. Hellebuyck appeared shaken, but after a trainer came out to look at him, he remained in the game. Lowry tied it 1-1 with 2:07 left in the period after he intercepted a pass by Flames forward Alan Quine, but 54 seconds later Gaudreau took a pass from Lindholm and put a backhand shot past a sprawled Hellebuyck to regain the lead. 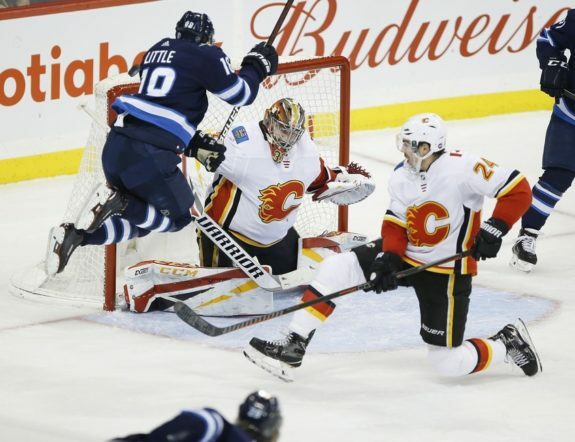 The third period included a two-on-one with Jets forward Bryan Little and defenceman Dustin Byfuglien, but Little’s shot hit Rittich’s body as he slid over to make the save. Laine then rang a high shot off the iron and Little fired the puck and Rittich made another save. Jankowski’s fifth of the season made it 3-1 at 15:39 and Gaudreau notched an empty-netter with 2:06 remaining. He left the ice right after that following a slash by Byfuglien earlier in the play. Calgary captain Mark Giordano, who had assist on the last goal, was playing in his 791st NHL game, tying him with Theo Fleury for fourth most games with the Flames in franchise history. Winnipeg hosts Minnesota on Saturday afternoon. Calgary hosts Vancouver on Saturday night.